I’ve seen signs up for Tuesday, Wednesday, and Thursday. Cleaning the streets is an annual event – prior to all the Decemnber holiday events on the Hill. The sign on our street says “wedday”. Can I get some clarity on when that is ? 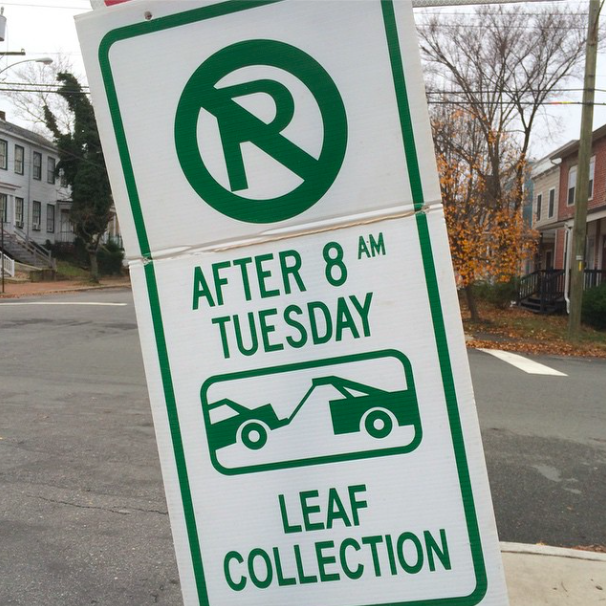 Can someone clarify the process here for those of us who haven’t participated in the city’s leaf cleanup before? Are we to bag our leaves and put them on the side of the street with the signs, or do they collect loose leaves, or do they do one side of the street and the other at separate times? Thomas, just sweep them out to the street, no bags. They are vacuumed up. There should be signs posted on your street as to when they will come. Also remember to move your car. It will get towed. And welcome to Church Hill! Some people blow the leaves into the street the night before, some people blow the leaves when they come by the day of. Some people are jerks and leave their cars in the street. If you live near nine mile road, they will tow you. I saw tow trucks lined up on 28th street today. If you catch them while your car is getting hooked up, they will let off for only $65 cash. Closer to broad evidentally they do not tow like they do in other parts of the city….. because they do not want to make certain people “upset”. As you might guess, I live on East Grace. I have seen plenty of cars towed on my street. Sometimes if it is one car they leave it, but why take the chance. And I saw 2 cars towed on the 300-400 blocks of N. 27th today. If we lived in the Museum District or The Fan, the City would rack and blow our leaves for us and then vacuum them up. True story – I bike to work in Carytown and the workers clean the sidewalks with rakes and leaf blowers before the vacuum truck comes by. Last year, they were towing cars like gangbusters around Nolde Bakery. They only put signs on one side of my block; I’m guessing because they ran out, having placed them every 6 feet along Broad Street.